Nashville, TN – The struggling Nashville Predators just can’t seem to find a way to win, falling tonight to the visiting New York Rangers, 4-3. 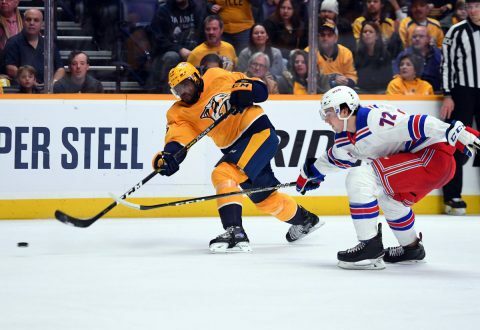 It was a back and forth affair with both teams trading punches and the lead throughout the game, but in the end, the Rangers, and their premier goalie, Henrik Lundqvist, leave Nashville with the win. Mika Zibanejad started the scoring for New York at 2:42 of the opening frame on a tip in that beat Pekka Rinne for the early 1-0 lead. Clarksville, TN – The Nashville Predators completed a four game homestand with a resounding victory over the visiting New York Rangers, 5-2. 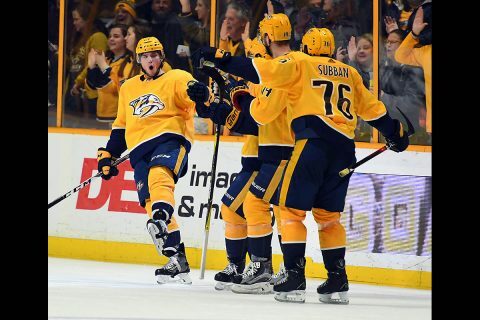 Nashville has now won eight of their last ten games with the Bridgestone Arena win. 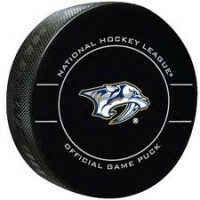 Predators goalie Pekka Rinne showed why he is one of the elite goaltenders in the NHL, stopping 20 shots and picking up the victory. The win is his seventh straight. The game was a physical affair with the Rangers losing both Marc Staal and Jimmy Vesey in the second period.